PHOTO FOLDER: Larger, higher-res versions of the images used below, and others, are available here. Each year law enforcement officers, several on snowmobiles, patrol the area and trails around the race to help provide a safe and fun experience for all. Enhanced patrols began Friday afternoon with the second-attempted Guinness World Record snowmobile parade. This year’s attempt, which is associated with race weekend, unfortunately fell short but drew many spectators to cheer the riders on. Officers assisted with traffic control during the parade. Patrols continued through the I-500 weekend, concluding Sunday morning. Along with the race itself, several thousand visitors and residents took to the area trails during the weekend. The patrol groups put on 490 miles on area trails. During the weekend, over 400 contacts were made, with 37 verbal warnings given out for various violations. 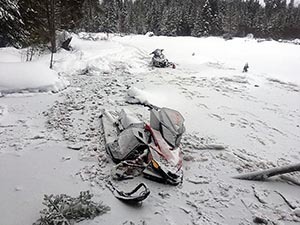 Twenty-one snowmobile-related tickets were issued for careless operation, sound level, registration and trail permit violations. One of the officers on a patrol sled was the first to arrive at a personal injury auto accident. He assisted at the scene until Sault Ste. Marie Police Department officers arrived. Fresh snow and temperatures in the 20s made for good trail conditions in the area during the Feb. 1-3 event. In addition to issuing tickets and warnings for various violations, officers answered questions, gave directions, advised riders of trail conditions and discussed operating tips developed for the state’s Groomer Awareness and Ride Right campaigns, which are aimed at increasing safety on the trails. Hagy noted there were no fatalities, or known snowmobiler accidents, in the enhanced patrol area during race weekend. In addition to Michigan residents, snowmobilers from Ohio, Wisconsin, Illinois, Indiana, Iowa and Ontario enjoyed the Sault Ste. Marie area trail system over race weekend. 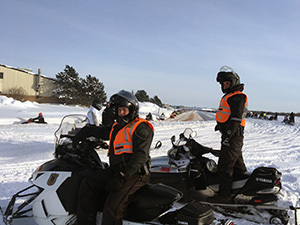 The enhanced enforcement effort also continued to focus on snowmobile noise violations, part of a statewide effort to create more enjoyable experiences for all trail riders and ensure the state’s 6,200 miles of snowmobile trails – 50 percent of which run through private land – remain open to snowmobilers in future years. Six tickets were issued for sound-level violations. 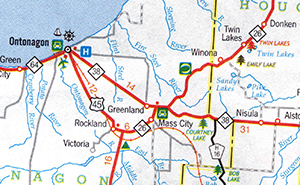 Michigan’s vast snowmobile trail system is the result of partnerships with private landowners who, through annual permits between the landowners and snowmobile clubs, open portions of their land for snowmobile trails. Without these partnerships, the expansive, interconnected trail system enjoyed by thousands of snowmobilers each year wouldn’t exist. In case you missed it, a Showcasing the DNR story was issued Monday about Michigan conservation officers and their responding to a long list of calls for assistance during the recent extreme cold and snowy storm conditions reported across the state. Read the full story here.